The NFL Combine, occurring in the spring, is a critical time in the Draft evaluation process for a NFL prospect. A player will be tested both physically and mentally over the course of these three days. Our goal is to make certain the player is ready for all parts of this challenge. An outstanding performance at the NFL Combine can propel a prospect's "stock" dramatically. Coach Mo Speedcamps are committed to working with each client to evaluate the current physical condition and needs of each player, prior to selecting the most appropriate NFL Combine Preparation Plan and Facility. We believe that every client offers unique requirements that are often applicable to the specific position and physical attributes required for the individual player. Therefore, our approach is focused on specific training for players to improve performance versus a one size fits all philosophy. Coach Mo has an established rapport with several agents and training facilities that have proven track records for outstanding performances at the NFL Combine. Coach Mo manages this process as part of our service to ALL clients. Click on the photo....see how we run!!!! Arizona State's Paul Fanaika (now with the Eagles), Luis Vasquez (Baltimore Ravens), Rodney Cox, Dane Guthrie and Angelo Hobbs-Valentino are joined Clint Polk (Oregon State), Brandon Rice (Cal-Davis), Green Bay Packer JaRon Harris (South Dakota State) and Pierre Parker of East Carolina to form our 2009 NFL Combine & Pro Day speed and afility camp. Training since Janaury, these promising athletes bought in to our relentless series of repetetive drills, intense agility workouts and the rigors of "The Hill" to build a picture of speed and are prepared to perform at their best anytime, anywhere. DALLAS -- Ever since Michael Irvin retired, he has heard that the Dallas Cowboys could use another wide receiver like him. Irvin believes he's delivering that guy to them. 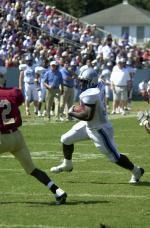 Former North Carolina WR Jesse Holley won "4th and Long," the reality TV show organized and hosted by Michael Irvin. Jesse Holley -- a tall, flamboyant receiver with a great smile and plenty of charisma -- was revealed Monday night as the winner of "4th and Long," the reality television show organized and hosted by Irvin, a Hall of Famer. 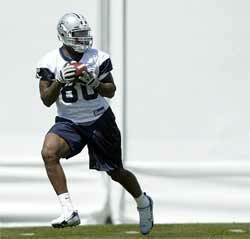 Holley's prize is the 80th spot on the Cowboys' training-camp roster and a standard rookie contract. However, with Terrell Owens gone and few proven receivers left, Irvin believes Holley, 25, could be more than just a practice body. "There's a great opportunity for my guy, Jesse, to do some wonderful things," Irvin told The Associated Press. "I think the world of Jesse. I don't think he'll let us down. I would not be a bit surprised if you guys end up saying, `Wow, look at what this guy has become.'" Holley outlasted five other receivers and six defensive backs to earn this unprecedented ticket into an NFL camp. Considering all of his Irvin-esque qualities, Holley was a shoo-in, right? "I can't tell you that I haven't thought about it," Irvin said with a laugh. "But we won three Super Bowls with the real Michael Irvin, so it's not a bad thing that he fits the Michael Irvin profile." While Holley now calls himself "The Michael Irvin Project," he's also quick to note that he and Irvin didn't click right away. "It wasn't love at first sight," Holley said. "It was more like a romantic rendezvous. He started to see more of him in me because of how hard I worked, how consistent I was, how I took to coaching." The 6-foot-3, 216-pound Holley is faster than Irvin was but more lanky. He's also less experienced, having played basketball and football while at North Carolina. 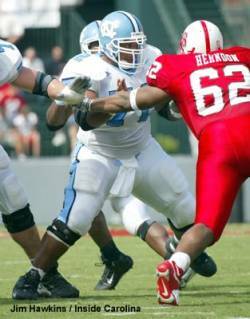 Holley was a backup point guard on the Tar Heels' 2005 national championship basketball team, then gave up the sport a few months later because he realized guys his size were more likely to make it in football. He put his decision in ink, getting a tattoo of steepled hands wearing receiver's gloves, surrounded by the words "Heavenly Received." 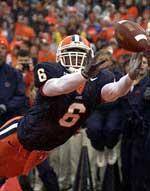 But Holley's only previous shot at the NFL was with the Cincinnati Bengals in 2007, when he went through training camp and about six weeks on the practice squad. 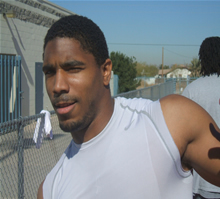 He said he earned a job in the Canadian Football League in 2008 but left without playing because of a contract dispute. 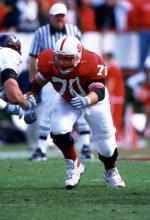 Holley didn't even have another tryout with an NFL team, prompting a tough-love chat with his godfather. 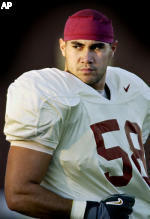 "He told me he didn't want me to be that guy who is 29, 30 years old and still chasing his football dream," Holley said. "He said, `You're a smart kid. Give yourself a timetable of when you are going to stop this.' So I told myself 2009 would be my last time trying to make this football thing happen. "Then '4th and Long' came along." A publicist at North Carolina steered producers of the Spike show to Holley. His first interview was supposed to last 10 minutes; it went 45. He wound up in Dallas, living in the Cotton Bowl along the other 11 contestants. All the wannabes had something that kept them from previously making it in the NFL. Joe Avezzano, a former Cowboys special-teams coach who guided the show's receivers, pegged Holley's weakness as toughness, figuring his smile, dreadlocks and basketball background were signs of a finesse player. 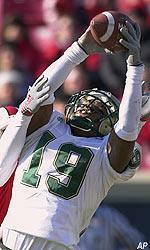 Holley changed that the day he flattened a taunting cornerback. "I thought, 'Wow!'" Irvin said. "Now that I know that's in him, the physical thing is taken care of." Since filming wrapped two months ago, Holley has been working out and soaking up Irvin's plentiful advice. After all, Irvin knows the chances for a second season could be riding on how Holley does. "Ultimately, it's called '4th and Long' because it is a long shot," Irvin said. "But this could be the start of a great career." First, Holley must prove himself to his new teammates and coaches, even those who were among the million or so viewers every week. "I'm already expecting when I get there guys are going to think I'm a joke, that I'm some slap-meat that they found on the street," Holley said. "That's absolutely fine. I understand that I have to come in and prove myself every single day. 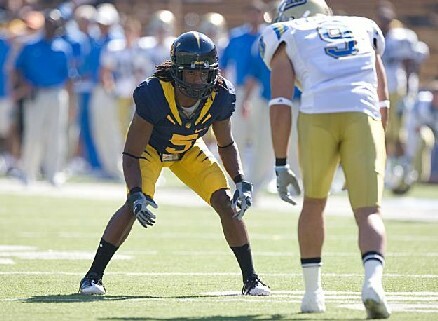 I think once they see me on the field, see the ability I have, you will hear those talks slowly quiet down. They'll quickly find out that I'm not just a TV guy. I can really play this game." Oregon State's Mich Meeuwsen (San Diego): From 4.8 to pro day 4.4 & 4.5s!!! Get ready for Pro Day and football upcoming combines. 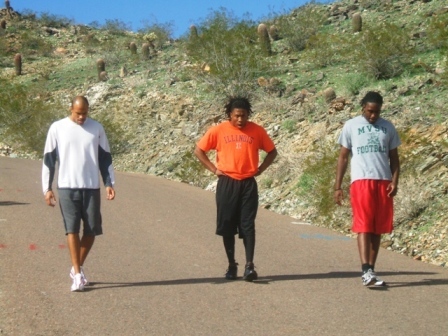 We prepare college, pro, semi-pro and high school athletes in pre-combine & training camp prep. We have a well earned reputation for dropping 40 yard dash and cone drill times. Our athletes are also known for their overall explosion and endurance. 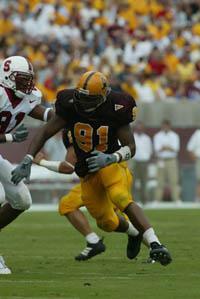 In 2003 Coach Mo Speed-camper Shaun McDonald shined at the Arizona State's National Football League (NFL) "Pro Day". Shaun trained with Coach Mo after a sub-par performance. Two weeks earlier he was clocked at 4.4 & 4.5, after a few sessions with us, he ran 4.29 & 4.3 in the was picked by the St. Louis Rams in the NFL draft. Terrell Suggs (Ravens) joined us after sub par performances in previous camps. He reported to Coach Mo after running 4.8 & 4.9 in previous combine efforts. After 2 weeks with Coah Mo, his time dropped to 4.6, his speed and conditioning rejuvinated, he was picked by the Baltimore Ravens in the first round. 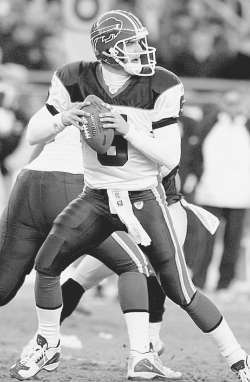 In 2004, Skyler Fulton joined after running a 4.6 in his first combine. Three weeks later his timed improved to 4.3. He ended up in the Colts training camp and was eventually allocated to NFL Europe. 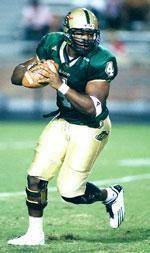 Speed camper Jason Shivers also was rewarded with NFL oppunities. 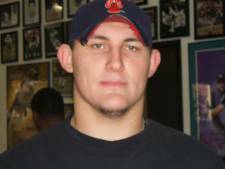 In 2005 the tradition continued with the class of Jimmy Verdon (Arizona State), Mitch Meeuwsen (Oregon State), Lofa Tatupu (USC), CJ Mosely (Missouri), Roddy White (UAB), Vince Jackson (Northern Colorado), Jason Brown (North Carolina), J.J. Arrington (California), Kelvin Hayden (Illinois) and Rob Hunt (North Dakota State), Kioki Fraser (Arizona) and a host of other prepared for upcoming NFL combines and Pro Day's with Coach Mo. Roddy White blew away his pro day with a 4.3 40 was picked up by the Falcons in the first round. 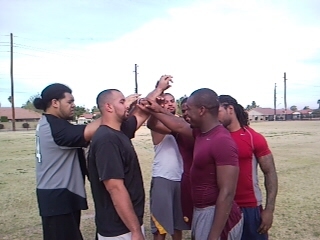 Arrington (Cardinals), Jackson (San Diego), Tatupu (Seattle) and Hayden (Indianapolis) went in the second round. 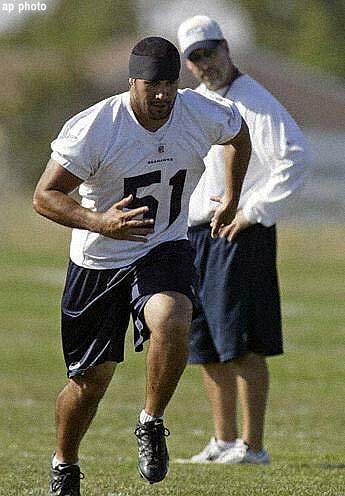 Tatupu (06) and Hayden (07) have since played in Superbowls. 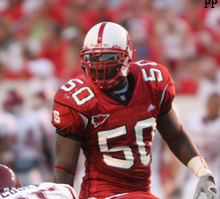 The Class of 2006 was headlined by North Carolina State's Manny Lawson and included North Carolina's Jason Brown, NC state's Stephen Tulloch, Marylands Garrick McPhereson, Virgina Tech's Daryl Tapp, Central Florida's Brandon Marshall, UAB's Daryl Hackney, ASU's Jimmy Verdun, UAB's Carlos Hendricks and others. 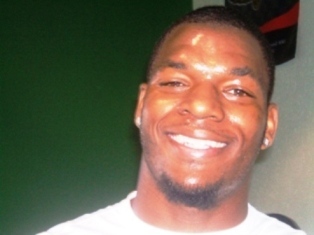 Lawson ran the fastest time ever for a defensive end in Indianapolis and was drafted in the first round by the 49ers. Tapp went in the second round to Seattle where he has an instant inpact as a rush end. 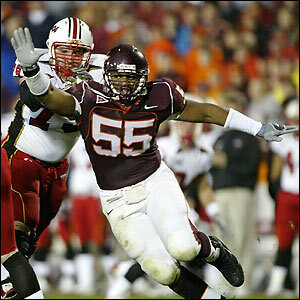 Tulloch was drafted by the Titans, Brown the Ravens, Hackney the Browns, McPhereson the Giants, Verdun the Saints, and Marshall in the second by the Broncos. Hendricks & Hoyte ended up in the Bears camp. The Class of 2007 reported with a smaller group, but is as usual, talent laden. Headlined by Clemson's Gaines Adams and Pittsburgh's Darrelle Reavis, the group also includes Rob Turner (New Mexico), Kelvin Smith (Syracuse), Dustin Frye (Clemson), David Herron Jr (Michigan State), Willis Barringer (Michigan), Chinedum Ndukwe (Notre Dame), Jesse Holley (North Carolina) and Jason Murrietta (Northern Arizona). 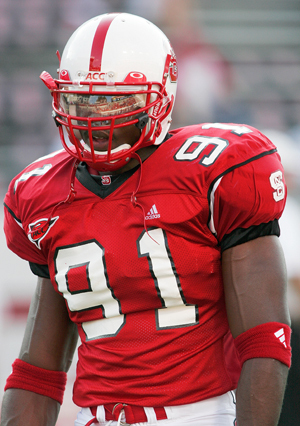 Adams was the fastest defensive end at the NFL Combine in Indianapolis and was drafted in the first round by Tampa Bay, where he joined Speedcamp alumni Simeon Rice. It was the second staight year we trained the combine's fastest defensive end andour third in 4 years (see Suggs & Lawson). The big story of 2007 was Darrelle Revis. Already considered one of the top three defensive backs in the draft, a sub 4.4 forty was a must to lock him in as a first rounder. Problem was, he reported with a 4.62 after a January time trial. After 6 weeks of hard work and dedication, he wow'd the scouts on pro day with a 4.3 forty. 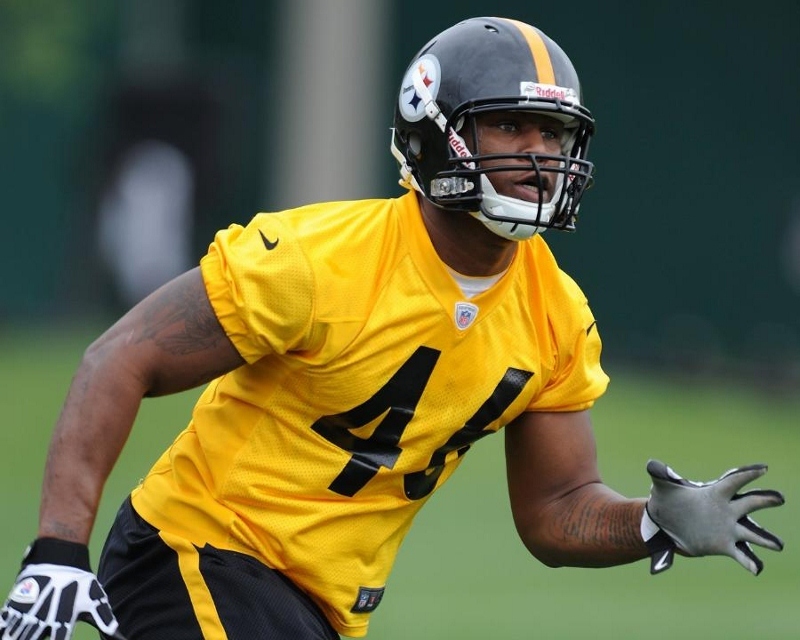 He was drafted in the first round by the Steelers. Shaun McDonald reported with a 4.6. 3 weeks later he goes 4.2 & 4.3 on pro day. Former Texas A & M two sport star and Coach Mo Speedcamper Martellus Bennett fulfilled a lifelong dream. He performed well at the NFL Pro combine and on his pro day and his reward, being drafted by the Dallas Cowboys. Talented former Clemson Tiger Barry Richardson and our fastest camper of 2008, Ron Girault, were drafted by the Kansas City Chief's. 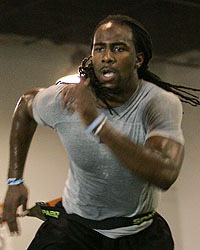 Darelle Revis makes a move that we work on in coachmo speed camps on a regular basis that becomes a pro day legend. The move came naturally to Darrelle Revis, so he executed it on the most critical day of his career, defying conventional wisdom in favor of athleticism. It came to Revis when training for the three-cone drill, a measuring stick for lateral quickness and change-of-direction ability. Instead of going around the cones during Pitt's Pro Day on March 16, he wowed NFL coaches and scouts in attendance by using a reverse pivot instead. "It was just something I did, but I guess the scouts went crazy over it," Revis said. "I pulled something out of the woodwork. It's a skill. When you've got some athletic ability, you can do things like that." That move, along with running a 4.38-second 40-yard dash, solidified his standing as a first-round pick in Saturday's NFL draft. It was, however, the second-most important reverse pivot that Revis has pulled off. The Class of 2007 reported with a smaller group, but is as usual, talent laden. Headlined by Clemson's Gaines Adams (Tampa Bay) and Pittsburgh's Darrelle Reavis (Jets), the group also includes Rob Turner (New Mexico/Jets), Kelvin Smith (Syracuse/Dolphins), Dustin Fry (Clemson/Rams), David Herron Jr (Michigan State/Vikings), Willis Barringer (Michigan), Chinedum Ndukwe (Notre Dame/Bengals), Jesse Holley (North Carolina/bengals), Tyrone Timmons (Chiefs) and Jason Murrietta (Northern Arizona). 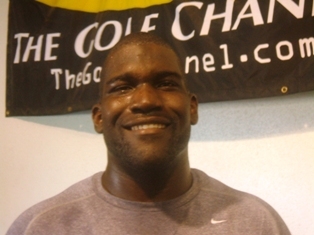 Adams was the fastest defensive end at the NFL Combine in Indianapolis and was drafted in the first round by Tampa Bay, where he joined Speedcamp alumni Simeon Rice. It was the second staight year we trained the combine's fastest defensive end and our third defensive lineman in 4 years (see Suggs & Lawson) taken in the first round. Tenths of seconds can literally decide whether a player is the top overall pick or a second rounder in the NFL draft. Outside of size, speed is the key ingredient an NFL team looks for when deciding who they are going to draft. Some players go into the draft with one knock being their speed. What do they do about this? Most players go to speed coaches, but these guys dont get the credit they truly deserve and NASFA has sat down with the best in the business, Coach Mo Streety. Driven: Revis reported with a 4.5, ran a 4.3 on Pro Day! 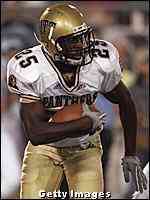 The hot name in scouting circles these days is Pittsburgh Panthers cornerback Darrelle Revis. As he prepares to crisscross the nation and meet with teams around the league, here's the inside scoop on why Revis is zipping up draft boards. He reported running a 4.62 40 yard dash. On his Pro day at the University of Pittsburgh, Darrelle Revis ran a jaw dropping 4.3 on most watches and the rest is history. He was drafted in the first round by the Steelers. Click on the photo and check out what Scout.com has to say about Reavis!!! The basics of what you need to know about Mo Streety, better known as Coach Mo, was in his white SUV. Near the passenger seat sat a Bible, which speaks of his deep faith. Stacked in backseat where a few Arizona Cardinals book bags, gifts for some of his many inner-city kids to whom he has donated his time. On the floor of the passenger side was a stopwatch, an instrument that has become as essential as footwear for the nationally known speed and track coach. And, of course, there was his cellphone, which was ringing again. Like it always seems to, oh, every two minutes or so. Streety strayed his his eyes away from the road and glanced at the buzzing phone. "It's Simeon Rice" Streety, said. But he didn't bother to pick it up and talk to the boisterous Tampa Bay Bucs All-Pro defensive end, who was one of the best athletes to ever attend his speed camp. Streety uses facilities at Phoenix Christian and Apollo high schools. Explained Streety, "I don't want to hear him remind me of how great he is." Oh, but on the contrary, it was Rice who spoke volumes of Streety during a nationally televised interview. Rice, a former Cardinals player, gave credit to Streety for his speed and performance on the field, calling Streety "the best at what he does." And what Streety does isn't just making athletes run faster. Streety's speed camps, which cater to every age and skill level, focus on explosion, change of direction and quickening reaction times to enhance real game-time performance. Youth and prep teams accross the nation have bought Streety in for weeklong or weekend camps. Streety's reputation has grown since his humble beginning in 1990 when he worked with two local prep running backs who wanted to do some extra training. Both backs became state class sprinters and All-America football players. His success career coaching sprinters and jumpers at Moon Valley, Desert Vista and Phoenix Christian high schools also helped his status. 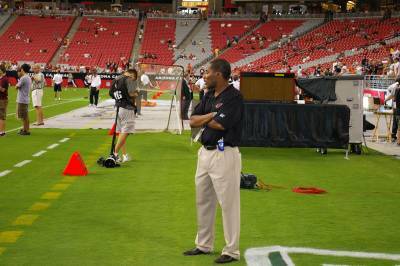 Then in 1999, former Cardinals player and all-pro defensive back Aeneas Williams began working with Streety. 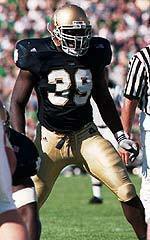 Now, his speed camps have notable alumni such as Rice, Williams, Tony Womack, Terrell Suggs, and Lofa Tatupu. He has also has NFL prospects the past four years who have impressed scouts at the NFL combine. Physical therapist Brett Fisher, has called Streety's teaching techniques "A-maze-ing." Twice. "It's unbelievable. Through his hard work, his athletes have had the fastest 40 yard dash times," Fischer said. "The previous year, JJ Arrington put on 11 pounds and still ran the fastest 40 time at the combine (for all the running backs). 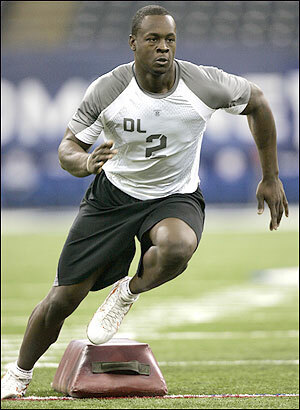 Manny Lawson ran the fastest time in the history of the NFL combine time for defensive ends (4.43). Mo talk about "The Hill"
It is dusk in the Southwest and still the temperature is well above 80 degrees. Rice gobbles down a bottle of Gatorade, slips in a Sade CD and begins the 15-minute drive to his final destination of the day, an upscale neighborhood on the southwestern tip of the city. It is an area known as The Foothills, for its proximity to the Ahwatukee Mountains and its scattering of rolling hills. And here, just as the sun runs out of fuel, Rice summons secret reserves of energy. 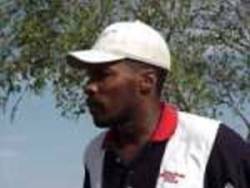 He'll need them all, because before him stands the day's most daunting challenge, a water tower outcrop about 500 meters high and about 600 meters long. 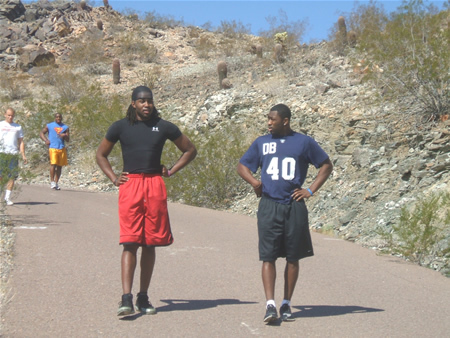 To Phoenix's elite athletes who dare to face it, it is known simply as The Hill. "The Hill is for the fourth quarter," Rice said. "It's when everyone else is quitting . . . and I'm not." Former sprinter Maurice Streety, now a local track coach who once oversaw updrade training for enlisted personnel and computer based instruction for Air Force pilots, keeps a watchful eye on his prized pupil. 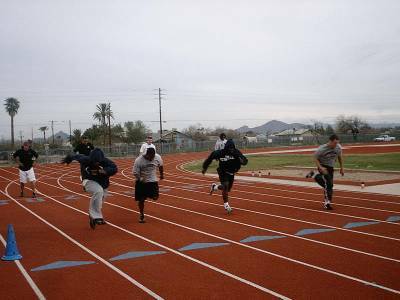 Streety, who has run with the likes of Carl Lewis, trains a number of professional athletes who live in or around Phoenix. His client base includes Cardinals Mike Bankston, Rams cornerback Aeneas Williams, Diamondbacks infielder Tony Womack and Nets forward Richard Jefferson. He also trains the finest in NFL Pro Draft prospects. "Nobody is quite like Simeon," Streety said. "Even the guys I thought were in his class need more recovery time. There are very few people who have that ability to fight off lactic acid buildup. It's all about being ready for the last two minutes of the game or being ready to respond, any time, anywhere, any place. He doesn't beg to quit, he wants more." Stepping under a railing designed to keep out teenagers and their cars, Rice and Streety stand at the bottom of the steep hill and make notice of the markings on the road. Painted there by Streety a year before, the five markers signify a series of intervals 75 to 100 meters apart, all the way to the top. Up a near 40-degree incline, the goal is to run a 600-meter sprint, then a 500 meter, then 400 meter and so on, up to the top. The drill is called the ladder. "I've had them all up here," Streety said. "And Simeon is the only one to do the double-ladder. That's back-to-back ladders. No one else (has done it). The only guy who comes close to him is Aeneas, but he didn't do it. . . . Of course, once he reads this, he'll be on The Hill the next day." Rice said The Hill's steep incline forces him to learn how to run forward, with his head down and his body letting gravity offer help. It increases speed when tired, something essential when chasing quarterbacks late in the game. "It's giving him remarkable endurance," Streety said. "He's one of the few athletes, that looks to perfect a certain phase of his game every week. He trains all day. He can't be still. Only about three percent of professional athletes are like this." 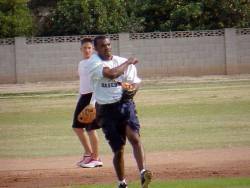 Created by Coach Mo and Andrew Reinhohlz, THE NEHEMIAH PROJECT is a non-profit Branch of Coach Mo SportsGroup promoting youth endeavors in the state of Arizona. Our goal is to provide athletes, parents and coaches a spiritual outlet through sports and to develop within each athlete, strong values and attitudes. To promote excellence in academics and amatuer athletics. To enhance and strengthen participation and competition in Jr. High and Sr. High schools in Arizona. To promote good sportmanship and citizenship. To foster opportunities for college scholarships. We fullfill our purpose by providing instruction and guidance to players and coaches, by providing opportunities for local, regional, national, and international competition and by working with other sports organizations established to benefit amatuer athletics. These days Dale Robinson is participating in the NFL combine as he starts his journey towards playing on Sundays. Time will tell how high the co Pac-10 Defensive Player of the Year will be drafted, but one thing is for sure  he would have been trained by one of the best in the business. Coach Mo, who also trained former Sun Devils and current NFL players Shaun McDonald and Terrell Suggs, talked to Devils Digest about his program and Robinsons training regimen in specific. We really work on track and field technique, said Coach Mo. 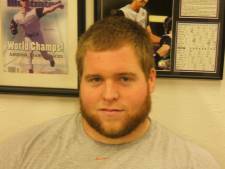 ASU and (strength and conditioning) Coach House have a great weight training program. So when players come out of the school and into their draft, their bodies are almost ready for the NFL. I work with the players on their 40 (yard) time, shuttle times, cone drills and things like that. They are all football players and they know how to do it. My job is just to make them do it faster. Coach Mo added that he employs the same techniques that were used by sprinters like Marion Jones and Maurice Greene. Former and current NFL players such as Aeneas Williams and Simeon Rice have used the program, as well as MLB player Tony Womack. 4 year speed camper Donald Askew makes immediate impression at spring practice. CHATTANOOGA, Tenn. --- Both sides of the football made strides this spring, and both sides have room for improvement once the preseason arrives in August. That was Head Coach Rodney Allisons take on the squad after Saturdays spring football game at Finley Stadium. In the controlled, 55-play scrimmage which pitted the offense against the defense, neither side dominated throughout and both sides gave fans and the coaching staff something to look forward to next season. The offense scored three touchdowns and kicked two field goals while the defense recorded two interceptions and stopped the offense on several third-down opportunities. Junior college transfer Donald Askew got things going for the offense in the early going, jetting around the right side for a 65-yard touchdown run. Sophomore back Erroll Wynn also reached the end zone on a nifty run, scoring from 24 yards out near the end of the scrimmage. The duo combined to rush for 167 yards with Wynn gaining 95 yards on 18 carries and Askew running five times for 72 yards. The Bills' Travis Brown was 11 of 14 for 119 yards in a relief role. Travis Brown, one of our original speed campers (class of '93) gets a chance to see significant time in a game vs New England. 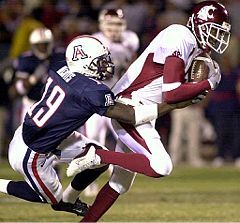 Travis trained with Coach Mo his junior & senior year at Moon Valley high school, where he played defensive back and quarterback. FOXBORO, Mass. - Quarterback Travis Brown got his first extended playing time of the season for the Buffalo Bills. He hopes it was not the last. Brown looked impressive at times Saturday, completing 11 of 14 passes for 119 yards after replacing Drew Bledsoe early in the fourth quarter. Brown managed to drive the Bills from their 2-yard line to New England's 1. But he threw an interception in the end zone, preserving the Patriots' shutout in a 31-0 win. Still, Brown was glad to finally get another chance to show the Bills what he could do. "I wish I would have shown them more on that last pass," Brown said. "But it was good to finally get some playing time." Brown has been a third-stringer for three seasons with the Bills, but has been the No. 2 quarterback the last two weeks because Alex Van Pelt has a sprained right wrist. The last time Brown played this much was in the 2001 finale at Miami when he came in for an injured Van Pelt the last three quarters. "I'm in a difficult situation here because there's only one quarterback that can play," said Brown. "In order for me to go in there, a good situation isn't happening for the team. Am I happy to get in there? Under the circumstances, it was tough but I was pleased that I was able to go out and have a little bit of success and move the team a little bit. But it's not an easy situation." That doesn't mean Brown doesn't want to return to the Bills. But with Bledsoe here and the likelihood of the team drafting a quarterback next spring, Brown may have to look elsewhere if he wants a chance to compete for more than a backup spot. "The clock is ticking," said Brown, a restricted free agent this offseason. "Four years in the league you're making too much money to be a third guy. Do I think I can compete for a starting job? I don't know. I haven't had that opportunity. Do I want to play? Absolutely. You don't come to this level without wanting to play. We'll see how it goes. But I'm not getting any younger, that's for sure." 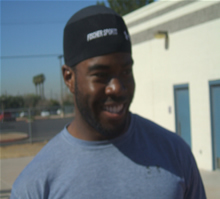 Arizona Diamondbacks star Tony Womack did physical training at Apollo High School's baseball field for the past few weeks. Tony was pleased to 'work out' with students and coaches at the school and conducted interviews with journalism students from around the district. Womack obliged Apollo administration by giving a 'pitch' to students on the importance of good reading habits to one's later years. His conditioning coach is former Moon Valley coach Maurice "Mo" Streety. Two of the hardest workers and toughest competetors of Coach Mo Speed Campers, Simeon Rice (Tampa Bay Buccaneers, DE) and Aeneas Williams (St. Louis Rams, DB) were again, named to the NFL's Pro bowl. Terrell Suggs (Ravens), who joined us in the spring, was named defensive rookie of the year. No - Not that Darryl Green. The Detroit Seminoles Darryl Green is about 125lbs heavier and considerably taller than the NFL's defensive back, retired legend. They both however, share the same noteriety and fame when it comes to football in the city of Detroit. By most account, DG is one of the most recognized Noles linemen in the Noles 12 year history and the accolades are dutifully earned. Known to all as Big Green, or the "Mean Marine" - Detroit Seminoles #92 - Darryl Green is the Detroit Seminoles All-Time Sack Leader and one of the top DL in Detroit city and Michigan semi-pro history. Considered by most as a gentle giant...that is until the ball is snapped. When that action takes place, Darryl Green seemingly at will releases a lethal combination of speed, power, and technique, far removed from anything resembling a 13 year veteran of semi-pro football. Perhaps Green, draws from the memory of his days as a decorated US Marine during Operation Desert Storm or excursions into Somalia. DG is as tough as they come when taking care of business as a soldier - ON and OFF the battle field. As a Marine, Darryl honed his skills and trained with the advanced physical and mental discipline of any Marine. That character has carried over well into his football career. While not engaging the enemy - Darryl Green starred as a superstar runningback for the US Marine Corp, before ending his military obligations. Mr. Green has a trophy case full of all league and all-american honors, but none can outshine, his recent accomplishments of ONLY a year ago, where he was voted All-MCFL as an Offensive and Defensive linemen, being the first Seminole player to earn 2 -way honors. 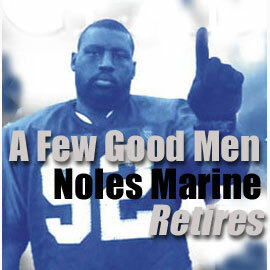 Age just doesn't seem to be a factor as DG is enjoying one of his finest season as a Noles DL and by some assessment has been the Seminoles top Defensive linemen in 04. Another good year. Congradulations to all of the players as they prepare for training camp as draft picks and free agents! NFL Pro Day Results.........Click Here! Rob Hunt: 5th round to Colts! Click here.......see how they run! 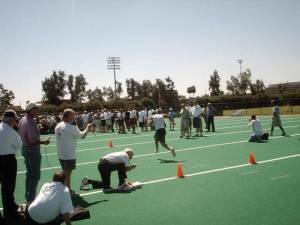 Speed Training for the NFL Pro Combine......Click here! Burner: Vince Jackson was drafted in the 2nd by San Diego! Combine training: Click on the photo....see how we train! NFL Draft picks Alabama-Birmingham's Roddy White, Illinois' Kelvin Heyden and Norther Colorado's Vincent Jackson headlined our fastest and most talented group of speedcampers yet. The group grows every week and now includes defensive backs USC's Lofa Tatupu and NC State's Chris Colmer as well as Cal tailback JJ Arrington. All first day picks! Never have so may run so fast. This year, Coach Mo teamed up with Brett Fischer and the results have been nothing less than phemominal! We represent more than a technical leap forward. 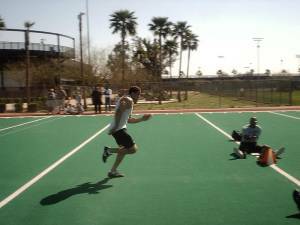 We add a whole new dimension to speed training.